This tool is used to rotate the active layer, a selection or a path. 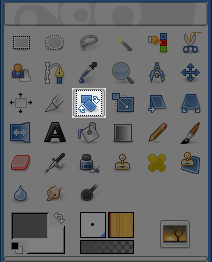 When you click on the image or the selection with this tool a Rotation Information dialog is opened. There, you can set the rotation axis, marked with a point, and the rotation angle. You can do the same by dragging the mouse pointer on the image or the rotation point. by using the Shift+R key combination. Holding Ctrl will constrain the rotation angle to 15 degrees increments. The Transform Direction sets which way or direction a layer is rotated. The Normal mode will rotate the layer as one might expect. 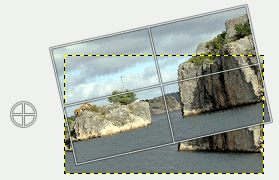 If a layer is rotated 10 degrees to the right, then the layer will be rendered as such. This behaviour is contrary to Corrective rotation. Corrective Rotation is primarily used to repair digital images that are not straight. If the image is 13 degrees askew then you need not try to rotate by that angle. 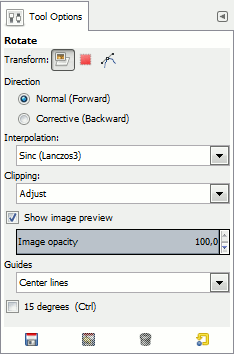 By using Corrective Rotation you can rotate visually and line up the layer with the image. Because the transformation is reversed, or performed backwards, the image will be rotated with sufficient angle to correct the error. 15 Degrees (Ctrl) will constrain the rotation to angles divisible by 15 degrees. Here you can set the rotation angle, from -180° to +180°, i.e. 360°. This option allows you to set the position of the rotation center, represented by a cross surrounded by a circle in the image. A click-and-drag on this point also allows you to move this center even outside the image. 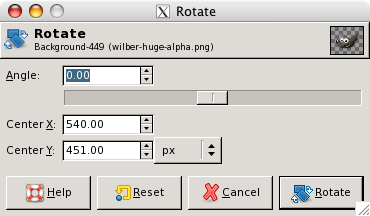 Default unit of measurement is pixel, but you can change it by using the drop-down list.